If you want to understand why Tim Tebow can’t find a team, look no further than the antics of one Iowa representative. We know that Tim Tebow isn’t very good at the whole throwing thing—always a drawback for a quarterback—but he has shown tremendous ability as an athlete and a divine flair for leading dramatic comebacks in the fourth quarter. He also would be an upgrade from several quarterbacks currently littering NFL rosters. There have simply never been so many bad quarterbacks leading NFL teams, yet Tebow’s phone isn’t ringing. His inability to get signed, as Yahoo! Sports columnist Mike Silver laid out very persuasively, owes less to his abilities under center than all the frenzy that surrounds him. Tim Tebow is a neon distraction in a league that prefers the equivalent of men in gray flannel suits. If Tom Brady is the Don Draper of quarterbacks, then Tim Tebow is Megan Draper, flashing some skin and singing French pop songs, equal parts transfixing and excruciating. In other words, even if many an NFL owner shares Tim Tebow’s politics, they don’t share his need for attention. Our pro football bosses like doing their political business in the shadows, and Tim Tebow has become a living, breathing avatar for those fighting the Gary Bauer/Focus on the Family culture war like it’s still 1992. Tebow is the only NFL player who can be described as having a base: a group of rabid fans who love him independently of his play and extol his greatness on the basis of his religiosity, his support for Focus on the Family or his wholesome whiteness. His base extends the tentacles of the culture war into any locker room he inhabits, turning any team he’s on into catnip for a media fiending to follow his every move, which only further alienates his teammates. The most compelling critique of Tebow, in my humble view, is that he has resisted any effort to disavow either his base or media attention, seemingly welcoming the distraction and even trying to leverage it to leapfrog toward more playing time. Your typical control-freak NFL head coach would rather have a player with a communicable plague than a player—especially a quarterback—who would relish this kind of constant distraction. That’s what made Monday’s speech by congressional Neanderthal Representative Steve King all the more tragic for the future career prospects of Mr. Tebow. In the well of the House of Representatives, where John Quincy Adams risked arrest and assassination by inveighing against slavery, King decided to talk about his favorite subject, “the gays.” (Dan Savage doesn’t dwell on the “LGBT lifestyle” as much as Steve King.) Normally, whenever the Iowa congressman speaks, you roll your eyes, check your phone and, just in case, put the Southern Poverty Law Center on speed dial. But in this case, he invoked the name of Tim Tebow as a contrast to the athlete he sees is “undermining Western Civilization”: Jason Collins. Collins, of course, just became the first active, male, North American athlete to come out of the closet. First of all, “followership” is not a word. Second, moments like this are precisely why Tim can’t find work, and it’s a shame. As long as he’s not on my team, I actually like Tim Tebow. In the “No Fun League,” the one thing you would never accuse Tim Tebow of being is boring. But while NFL owners might financially support the Steve Kings of this world, people like him are seen as strangely gauche: the relative you keep locked in the attic when company arrives. Tim Tebow, if he so desired, could disavow Representative Steve King, the same way he cancelled a speaking engagement at a new $130 million Dallas megachurch after finding out its pastor, Dr. Robert Jeffress, believed Jews, Muslims and gay people were going to hell (it’s worth noting that Tebow did not condemn these comments and, according to Jeffress, has plans to reschedule). But at this point, the former Heisman trophy winner may have better future prospects as a speaker on the evangelical gravy train than as a quarterback, and if there is one thing we know about Tebow Inc., it knows where its bread is buttered. I fear, however, it will soon learn that the true Sunday megachurch in the USA is an NFL stadium. 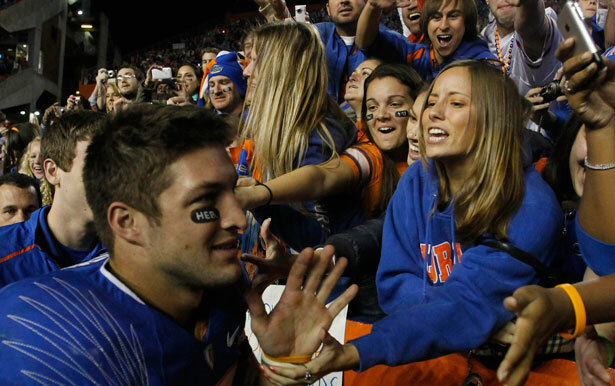 Without a team, Tim Tebow in time may find himself without a flock. Meanwhile, two progressive congressmen are calling for a constitutional right to vote. Read John Nichols’s take.